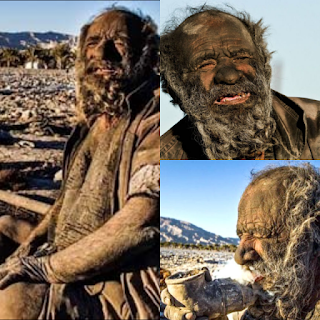 If we didn't bath for one day we don't feel comfortable, that day is not Upbeat for us, but for 60 years you did not have a bath, you might thought that story, However, the life style of this Amou Haji show in Iran issurprising,as well as nausea. That's why he's the most Dirty Person in the World. He is 81 years old, he asked that you have not bathed for so many years, and he answered that If you bath, You will lose your health. he asked what you do for food! He lives nearby the highway road of Iran and is eaten by dead, rotten meat. His daily diet is the meat of dead animals that fall into the wheel of the road! Another point is that he has no cigarette and no love.and he smokes Cigarette sometimes. his life style has only kept his health safe. because he don't bath but he drink lot water that thing kept him healthy.